Today's most relevant social platforms are all about the here and now. Twitter offers brands a unique platform to engage people in direct, valuable, real-time conversations – and today that has become really relevant because Twitter's 'new position'. Twitter's mission on their website is: "To give everyone the power to create and share ideas and information instantly, without barriers." How do you use that power? Twitter just a couple of weeks ago switched its position from social network to 'News' on the App Store. While most of us can understand the new position – micro-blogging platform Twitter will no longer fight for pole position with the likes of Facebook on the Apple App Store. Twitter is well known for real time news feeds and events and unlike Facebook, it is preferred less when it comes to keeping in touch with friends. 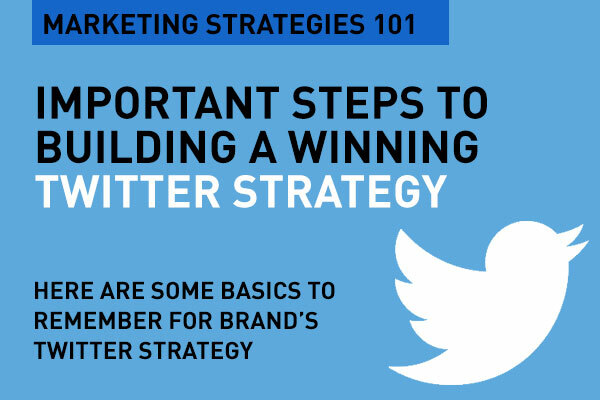 So, how do you build a winning twitter strategy in 2016? 1. Set goals. Have an audience strategy first. Start with an understanding of your target audience and what they are looking for from you on twitter, in particular. Customer Insights is your First Step in Digital Marketing. Marketing today is not about your brand or product – it's about the customer. Digital marketing is built around the customer, the audience you want to talk to, and getting proper insights about your customer, the consumer, their needs is what should be your first and fundamental step. You can't have conversations on twitter without knowing who you are talking to. Read about how Listening is important in social media. 2. Engage in a dialog. Try and have an exchange rather than just do brand/product shoutouts. Basically, you are looking for conversations and ways to connect to the people out there. That's a feeling of community, of following, not preaching product benefit. And, for a brand, twitter is a lot about customer service. The key word there is service. Service as an on-going and meaningful dialog with your customers. There's a golden 80-20 rule that suggests that around 4 out of 5 of your tweets should be involvement with your followers, your 'community'. Which means you need to Retweet, re-post with comments and add value. It's the sharing and caring that shows value for those who follow you and those who you want to be followers. It also shows you are on topic and on trend and are not me-me-me. Most twitter communities in the Middle East seem to like participation and replying. They like being heard. Also, look to leverage the 'sneezers' or viral influencers. Just as you wouldn't just talk about yourself in real-world conversations, follow that common sense on Twitter. Have conversations about the things that really interest your followers. Talk to your Twitter audience the way you talk to people in real life. This is your chance to be open, honest, in the here and now and relevant. Conversations make twitter happen. Engagement on any social is about a dialog, about participation. Not selling. If you are pure selling product benefits and features, you are not really going to get much out of twitter engagement. Try and provide tips, useful information, useful links, re-shares of stuff that's relevant to your genre but not necessarily about your brand. Value is about knowledge, news, information. And for your brand or product the tease-and-reveal works well. Have special offers? Twitter is the place to put those out. Whether it is information, entertainment or content built around news or riding a trend, value provision is key. You’ll know what that value looks like if you’ve been actively listening. When you add value to people’s lives, you become more relevant to them. And value for your audience is not necessarily built around what you do – it's about what they want to do. Read how Consumer intent is key. 5. Write well. Use visuals. Twitter for brands is often about mastering the art of writing a 140 character headline. Grab the attention with a clear benefit and perhaps a call to attention. The link, the photo are like the rest of the ad. It's the first few attention grabbing words that matter. Craft those well. Remember 60% of active twitter users use their mobiles. Grab the attention quickly and succinctly. Develop a conversational style that is consistent and unique to your brand. This inspires a dialog, and encourages your followers to keep looking for an 'engagement' with you. A strong, unique tone-of-voice helps you stand out, and gives people a reason to follow and engage with you over all those other brands’ self-promotional feeds. Today's connected consumer is looking for visual enhancements in all social conversations. Your target group on Twitter is likely to belong to a visual generation. Use added media such as images or short videos to support your tweets and attract people’s attention. 6. Stay on trend, react quick, be relevant in the now. Twitter is all about the here and now, so you can't keep tweeting about your brand, for your brand or product while asleep at the wheel. Stay on trend. Be aware of what the conversations are about and see if there's a fit. Tweet on those. This doesn't mean you try and hijack trending hashtags. And, no point on tweeting about hot trending global topics unless they mean something to you. Geo-fence your strategy. Your topics have to be in context and be current. No one likes yesterdays news other than fish-and-chips shops. Remember that Twitter success isn’t about the number of followers you’ve got. Instead focus on the quality and level of engagement your brand has with your audience. 50,000 followers are useless if they're not really interested in what you have to say. 7. Track and measure. And adapt. Track every tweet that you have posted. How did they fare? If you do't have the tools to measure and monitor use a simple one like Tweetreach. You need a fair idea on how you are doing – getting which ones right, and which wrong. This is critical. Monitoring your tweets’ performance will give you insights into your Twitter strategy, and your audience’s preferences and motivations – and what they basically want to hear and know about. Adapt. 'Tweaking your tweeting' as you learn helps your brand consistently perform, engage better, and have loyal following. If you haven't really gotten good results on Twitter, read about 3 quick ways to improve your Twitter performance. Remember the Dont's as well: Do not spam. Do not spam. Don't overuse #hashtags. Never ever buy followers – that's shallow and deceitful to your audience and to yourself. Don't use software to auto-tweet – that's not just lazy, it's bad twietiquette. How often should you tweet? Read about social media frequency best practices here. With Twitter now positioned as a News App – and not a Social platform – how should brands react? That's the basics of digital marketing using the power of the here and now via Twitter. That's your Digital Marketing Strategies 101. Thanks for the TweetReach by Union Metrics mention. We appreciate it! Thanks for the post. This is a great post on getting the basics of twitter based social media marketing – and some of the steps mentioned are essential for any company that relies on twitter as part of social media efforts.